CEU Sales Performance training programs were created for the retail store environment. Our program offerings include pre-work, participant driven workshops & follow up on the job training exercises. In addition to the programs described here, CEU creates customized training to meet your specific management, sales, trainer development, or customer service performance goals. 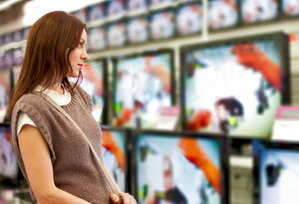 The explosion of internet and non traditional superstore competition provides tremendous new challenges to electronics and appliance specialists. The customers we contact have more access to information on products and prices than ever before. CEU Sales Training Programs show salespeople how to differentiate themselves and provide real value by moving from the traditional role of product focused expert; to that of customer-focused problem solver. CEU sales training proves that just caring about customers is not the same as customer focus. They provide sales teams with new perspective, and also with the real world tools they need to provide a game changing customer experience. This workshop introduces the Customer-Focused Sales Process: a game changing approach that can help your team provide customers with a vastly improved experience, while increasing conversion rates, margins, and attachment sales. Participants leave this workshop with a clear understanding of how solution selling and partnering with customers differs from technology/benefit presentations and competing with customers. We prove why the customer focused process is best suited to today’s challenging markets and how this new perspective drive sales, profitability, and their own job satisfaction. Role play dialogs using scripts specific to your business show specifically what customer-focused selling looks like on the job. Participants leave understanding the 5 steps of the Customer-Focused sale, as well as the critical skills they need to execute it. Managers are provided with follow-up tools to practice, coach, and monitor solution selling with their teams. Connecting with Customers- customer focused engagement strategies and dialogs that transition to solution focused rather than technology/price focused conversations. Lifestyle Questioning and Solution Diagnosis– developing your library of customer specific questioning scripts that reveal needs, build trust, and lead to total solution presentations. Identifying and Introducing Solutions- Understanding your inventory from the customer’s perspective. How to select optimum solutions, identify reference products, and introduce customers to a collaborative customer specific demonstration process. Presenting Total Solutions - Participants learn to create, practice and critique presentations of your offerings that begin and end with customer needs rather than product features. They learn to introduce reference demonstrations that give customers perspective in making the right choice, and how to incorporate total solutions into every demonstration. Gaining Customer Commitment - Participants learn and practice how to commit customers to the next step in the solution sales process. Customized to your specific business, this workshop challenges participants to identify win-win outcomes of solution sale presentations and provides tools and practice in achieving those outcomes. This workshop provides follow up that reinforces and deepens the impact of Customer Focused selling in your sales team. The workshop introduce the “4-Ws” as a tool to evaluate the successes and challenges of implementing customer focused selling. The critical skills of transitioning and communicating company advantage stories are explored, role played, and critiqued. Participants practice creating and executing lifestyle demonstrations. They leave with new self and peer coaching tools to analyze and debrief the sales process. The workshop concludes by creating and committing to a specific action plan to monitor and peer coach the customer focused sales process at each job location. · Experience the full impact of high performance audio in your home. For retailers, C.E.U. can teach your team the key words and phrases that quickly identify and prioritize each customer’s audio needs and provide tools to present products that best meet these needs. For manufacturers, we work with you to develop sales training that integrates your key product benefits with solution focused presentations. Customer focused selling profoundly changes what we say and do in every presentation. It also changes our sales goals and strategies. This workshop reveals how the presentation of warranties, installation, and other value added products and services fit into the customer focused paradigm. It contrasts traditional key category add-on presentations with a truly customer focused solution dialog approach. Participants develop, practice and critique presentations that partner with customers to fill real needs. They leave the workshop with the understanding and practical tools they need to present total solutions while building lasting client relationships. The Total Solution Sale. Participants learn how to utilize lifestyle vignette areas on of the retail store to present total solutions. We review the crucial importance of presenting total system solutions and solving real problems and the barriers to its execution. Participants learn key strategies for transitioning, diagnosis and total solution demonstrations utilizing your existing store vignettes. They are taught proven strategies for developing their own customer-focused presentations. Participants role play sales scenarios using actual displays, and learn to debrief the results. Post work practice tools provide managers with direction to leverage new skills in the future. This workshop is aimed at reducing the cost and frequency of returns, building your brand, and growing your client base by understanding and responding to unsatisfied customers. Participants learn the importance of a positive experience to profitability and the specific bottom line costs of dissatisfied customers . Customer frustrations specific to your industry are discussed and prioritized. Participants develop alternative solutions and evaluate them on the basis of effectiveness, cost, and likely customer response. Participant take part in realistic scenario role plays emphasizing the crucial skills of active listening, empathetic response, problem solving and consistent follow up.